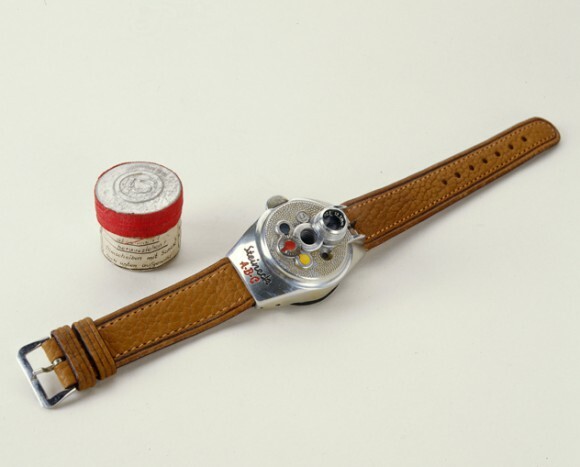 This cleverly disguised subminiature camera allowed an agent to take photographs while pretending to check his or her watch. At first glance it’s a stylish wristwatch. But look again—it’s really a miniature camera. An agent would carefully aim the camera while pretending to check the time—no easy feat since there was no viewfinder. Pressing a button on the watch snapped the photo. The Steineck, a product of post-war Germany, was especially good for photographing secret meetings, private conversations, and other close encounters. Its film disk, about an inch across, could produce eight exposures.